Indonesia Office System MVP Aris Lesmana is a Microsoft Certified Trainer and Certified EC-Council Instructor with more than ten years of computer experience. 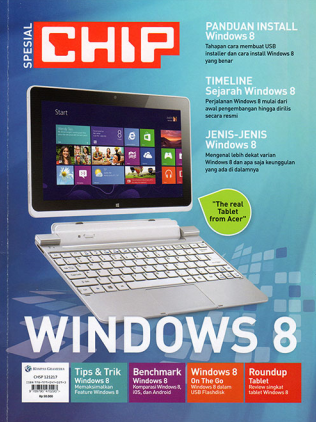 With the hype and excitement stirring around Windows 8 and not forgetting Microsoft Office 2013, Aris wrote 3 articles in Bahasa Indonesia and these were published in CHIP Special Edition: Windows 8 (January 2013 issue). Aris wrote about all things Windows 8, with highlights on the Windows 8 features and of course a list of interesting applications that you can find in the Windows Store. 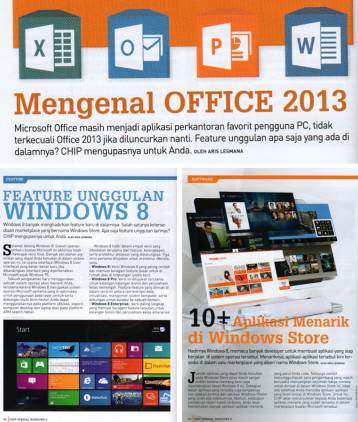 Plus, the article on Office 2013, includes an introduction, and overview of the office applications. CHIP Magazine Special Edition Windows 8 is suitable for anyone who wants to switch to Windows 8 or for those who want to know about the latest client operating system from Microsoft. If you are keen to read his articles, grab a copy of the magazine at the stores, before it runs out. Majalah CHIP is one the leading Computer Magazine in Indonesia. This magazine has about 65,000 circulation monthly with more than 100,000 readership. ← Huat Ah! Here’s Wishing SEA MVPs A Happy Chinese New Year!